.375 calibers 9/7	.416 calibers 9/9	. I want to correct page 9/17 and 9/19 mentions of the ".505 Van Horn," which does not exist. (The .500 Van Horn Express uses a .510 bullet.) To my knowledge, the first to neck up the .416 Rigby to a .505 was Dane Burns of Burns Custom. Hence, I should have properly credited his wildcat as the .505 Burns. My apologies to Dane for not getting this right. He reports that the case shoulder is sufficient for good headspacing, something I was skeptical of on page 9/17. This round is good for 500gr/2350fps and 600gr/2200fps. Pressures are mild at about 39k. For more details, go to http://pistolsmith.blogspot.com. On pages 9/42-46, I published a "thesis" written by a then friend of many years whom I believed in good faith qualified to offer it. "A Few Words About Cast Steel Rifle Receivers" posited that cast gun steel (weight for weight) is inherently weaker than forged gun steel, and thus less desireable in a dangerous game rifle (DGR). Based on my good faith belief in this "thesis" (and its author's insistence), I explicitly warned my readers from considering certain brands of bolt action rifles for their DGR, namely the Ruger M77 Mark II Magnum (on page 9/29). The "thesis" was vigorously challenged on a forum by an Australian fellow who worked in the field of metallurgy, beginning here (or here). Read through to page 6; it's very illuminating. After trying to single-handedly defend a "thesis" not my own (and without any public support of its author), and after dozens of hours of technical research into the matter, I could not find a single reference to this issue with the steel used in modern firearms. Nor did I discover any report of any catastrophic failure suffered by any cast steel dangerous game rifle. Medium carbon gun steels are hypoeutectoid (medium carbon), not hypereutectoid (high carbon). As best as I can so far know, the "thesis" simply does not — cannot — apply to receiver steels as 4140, etc. of <0.83% carbon content. Moreover, I was stunned to learn that the "thesis" author personally owns (or has owned) at least two dangerous game rifles made of investment cast steel (a Ruger #1 Tropical in .458 Win Mag, and a CZ-550 in .375 H&H). The evident ignorance (or hypocrisy) therein had the effect of fully imploding my faith in the author's relevant knowledge of the issue. While I respect his pattern steel knifemaking ability, he does not cast and forge his own material for knives (and certainly not for gun receivers). He has no degree in metallurgy or engineering or science. 1. unavoidably contain (as a result of the casting process) dendritic carbides which act as "failure paths,"
I will mail such person within 30 days my sincere thanks along with a postal M.O. in the amount of $500 (raised to $1,000 in January, 2011). See Post #136. Barring any new information, I must herewith consider the controversy settled. Although I do not personally gravitate to cast steel firearms, it now seems clear that the "thesis" was fundamentally and fatally inaccurate and thus unfair to the manufacturers of quality investment cast steel guns. I regret the error, and apologize for unknowingly publishing such information. I no longer can, in good faith, continue to generally dissuade my readers from investment cast steel rifles. "a proposition stated or put forwarad for consideration, especially one to be proved or maintained against objections"
"Update! This "thesis" is now discredited. 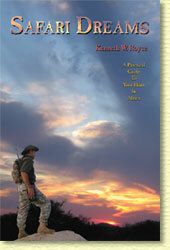 Kenneth W. Royce regrets its publication (www.tinyurl.com/caststeel — read to pg. 6)." I will remove this "thesis" from the first reprint of Safari Dreams. Meanwhile, any distributor who wishes to carry the title without that 5-page "thesis" will receive their copies with such neatly removed at no additional cost.